Last July, animal advocates around the world celebrated the rescue of a captive elephant named Raju who wept "tears" after being freed from a half-century of chains in India. The move was seen as a legal victory for elephants across India, as well as a much-deserved retirement for the elderly elephant who had suffered abuse his whole life. What few people know, however, is that there was another elephant who was supposed to be rescued with Raju that same July night. His name is Mohan and he is still in shackles as rescuers fight "downright dangerous" obstacles in an effort to free him from his abusers. Raju and Mohan met when they were calves in the 1960s, chained and put on display together at cattle fairs in India, according to Wildlife SOS, the NGO that rescued Raju and is leading the charge for Mohan's release in conjunction with the Uttar Pradesh Forestry Department. They were eventually purchased by different members of the same family and subjected to "abuse and beatings during their training process," says the organization. They lived and worked together for years - and were chained next to each other at night. 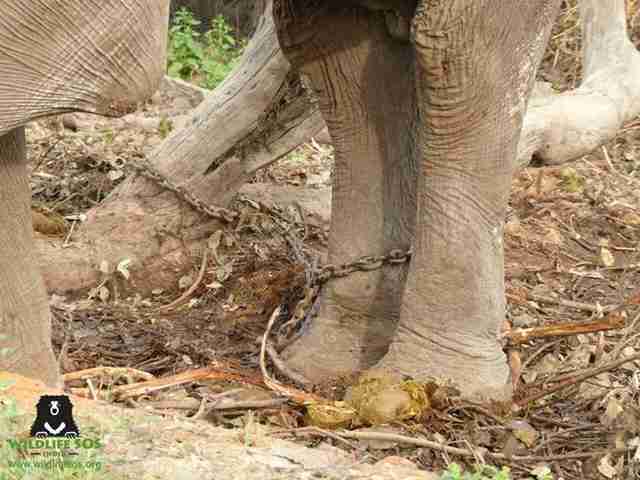 "The fact that they were chained together at only a trunk's length away from one another for so long makes them brothers in pain," said Kartick Satyanarayan, co-founder of Wildlife SOS. "While there is no evidence that they are related by blood, the years of abuse they withstood side by side surely must have bonded them. And each was the other's only witness to the suffering and brutality they endured." According to Wildlife SOS, Mohan is a 56-year-old bull elephant who is suffering extensively from injuries, dehydration and malnourishment. Based on the group's examination of his dung, Mohan is eating plastic for food. Wildlife SOS says Mohan continues to live as a working elephant and carry heavy loads. Although last year's plan was to rescue Raju and Mohan in unison, "tragically, Mohan disappeared without a trace during our final rescue operations," the group wrote on its site. Since then, Wildlife SOS says it has been working to secure Mohan's release, and recently amped up the effort. The situation has proven to be tense. 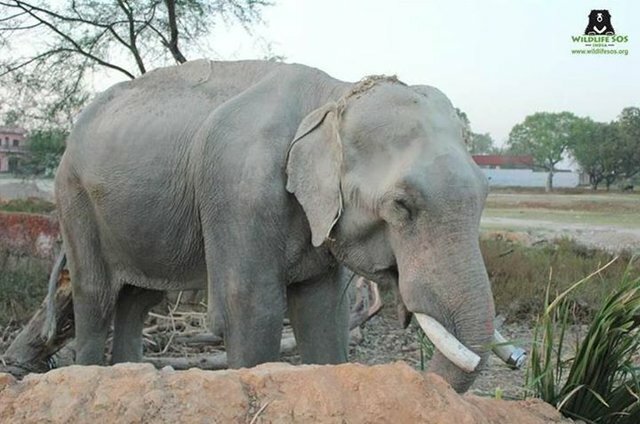 On March 19, a Wildlife SOS veterinary team went to the village of Laganj to examine Mohan but had to retreat when an angry mob confronted them. 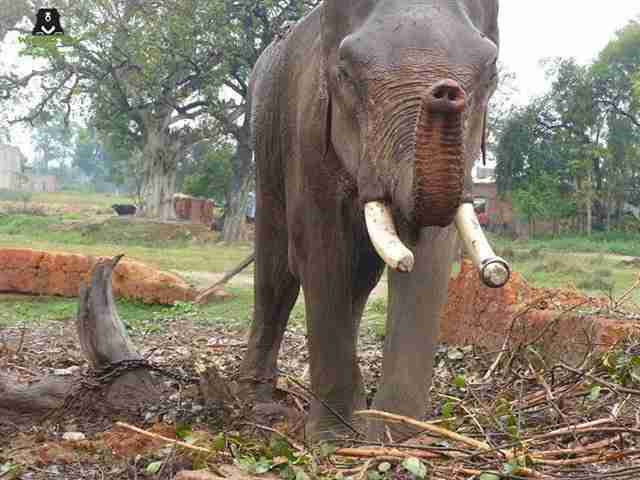 "Knowing our intent to rescue Mohan, his mahout [keeper] had incited a local group to stop us, by any means necessary," Wildlife SOS wrote on Facebook. Two days later, a 10-man Wildlife SOS team returned to the area to continue the rescue - this time accompanied by 30 police officers and 15 forest officers. The team sedated Mohan in order to guide him onto a rescue vehicle. Once again, their efforts were thwarted - a massive mob of 300 people refused to let the team move Mohan. The situation rapidly deteriorated from bad to worse and from murky to downright dangerous. After a couple of our team members were nearly roughed up, it became clear that we needed to back off ... both for the safety of our team, and that of Mohan. 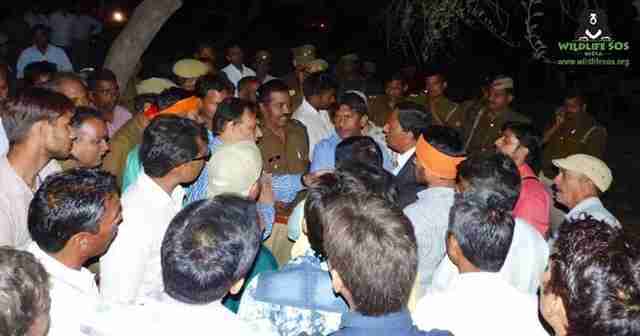 The police and the district administration advised us to move out and come back in a day or two with reinforcements. We are disappointed but we will not give up on Mohan. The Dodo will continue to report on the rescue efforts of Mohan. To follow the effort to rescue Mohan and sign any petitions, go to the Wildlife SOS Facebook page.